Would the "copper foil" method work for this problem? Or does that pertain only to a different kind of wiring setup? 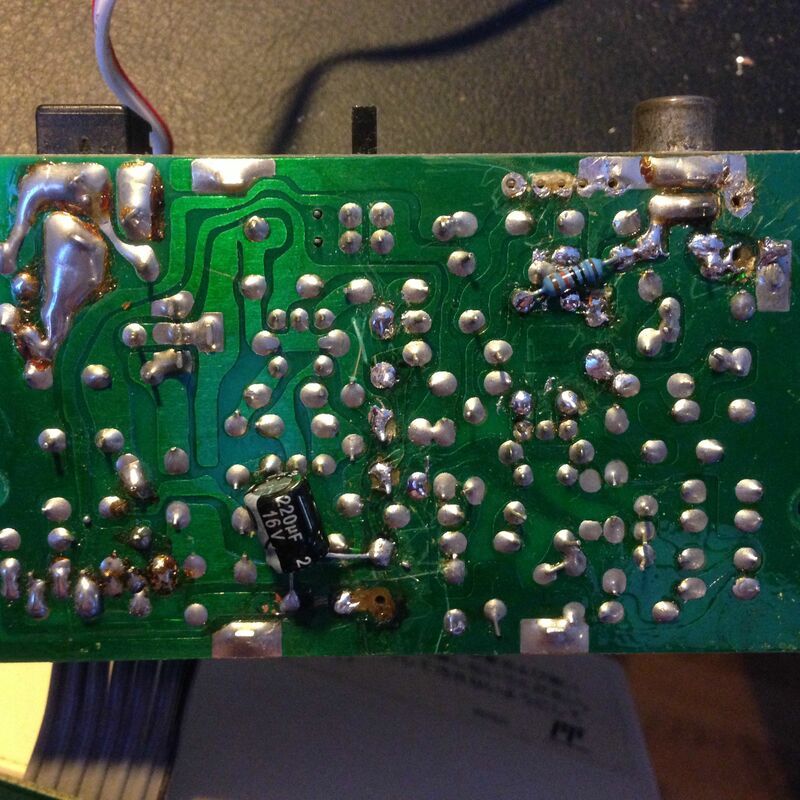 So I was trying this as my first ever soldering project and i went horrible. I only hade one pretty big tip and it was a bit harder than i thought to get rid of the components. So i was trying to se if i get some video after this steps but there is none. Can this be saved or is it dead? Last photo the jump wire is shorting to another pad. Well, I followed 80sfreak guide and while I got sound, I couldn't get video output. 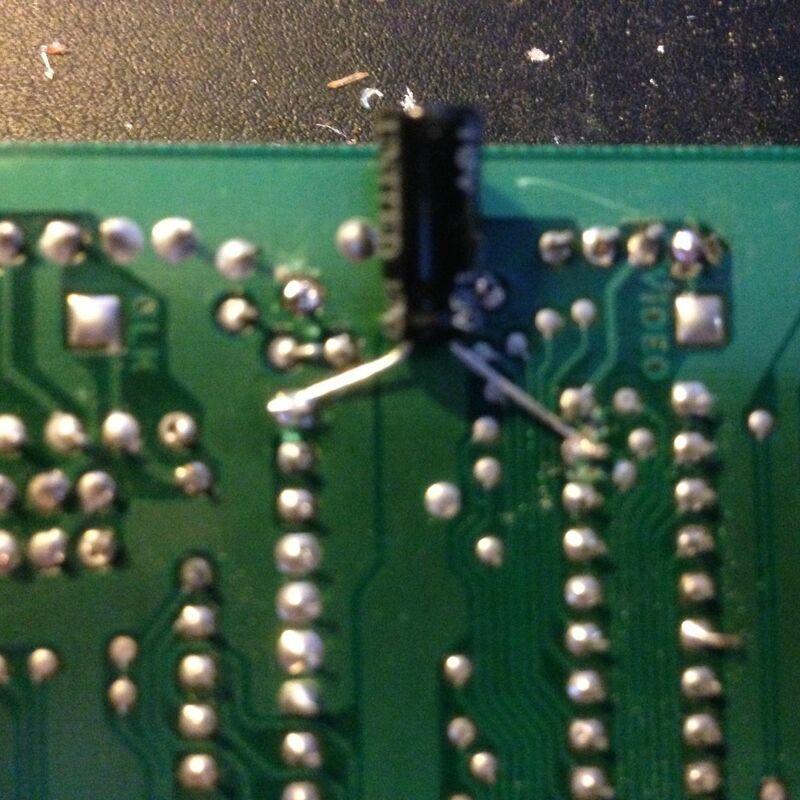 I cut the trace to isolate pin 21, routed that signal to a 2N3904. Built the circuit as it says in the guide and got nothing. 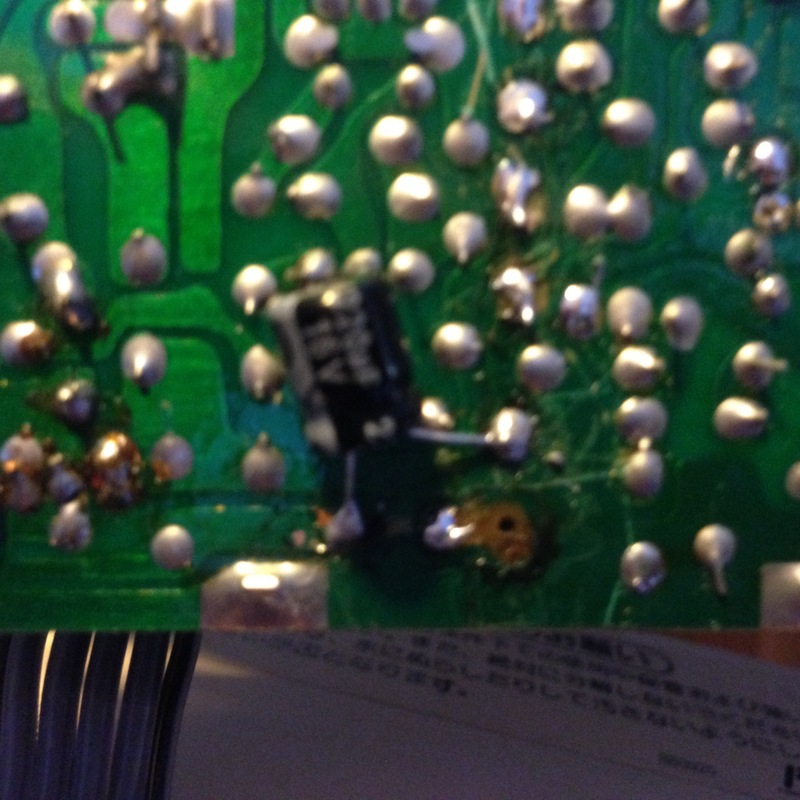 Maybe on this transistor I'm supposed to wire it up like the Sega Genesis S-Video mod? Like E is out, B pin 21, C is 5v. As opposed to the guide's E is out but connected to two resistors that are connected to 5v, and a capacitor, while C is Ground. However, will try again later. BTW, broke the microphone switch for the second controller. Going to have to install a toggle switch eventually. Are you using the transistor that's already on the famicom. No, as I said, I was using the 2N3904, I've read people also having success with it, and I didn't feel like desoldering stuff then. Though next time I'll try to build a circuit with it. Used the original transistor, and the mod worked. I also used a 47uf capacitor because I didn't have a 33uf handy. Now I have to do some straightening out, including rewiring the mod, and repositioning the board. I guess I'll put the output jacks outside one of the controller holes, considering I don't feel like drilling holes in the system. I had to disable the microphone on the second controller due to broken metal tabs. I bridged two solder points and it worked like a charm. Hmm.. I got in a second Famicom, this time it's a 1988 model. I performed the mod the right way, wiring it exactly like the last one. However, I got no output whatsoever out of this one, even sound. I checked the fuse, a current went through it, 1.5A. I hope it's the voltage regulator this time. So the pin at 46 should be leading out closer to the ground and voltage point right? I was rather rough with getting the transistor out of this unit though I wonder if I broke it by accident. Does anybody know a more readily available alternative just in case. might be a silly question, but did you get any picture with RF before you did the mod? the post inspired me to purchase a cheap famicom from ebay, is a 1983 model. works great and produces a decent picture, however as other have said there are jailbars. 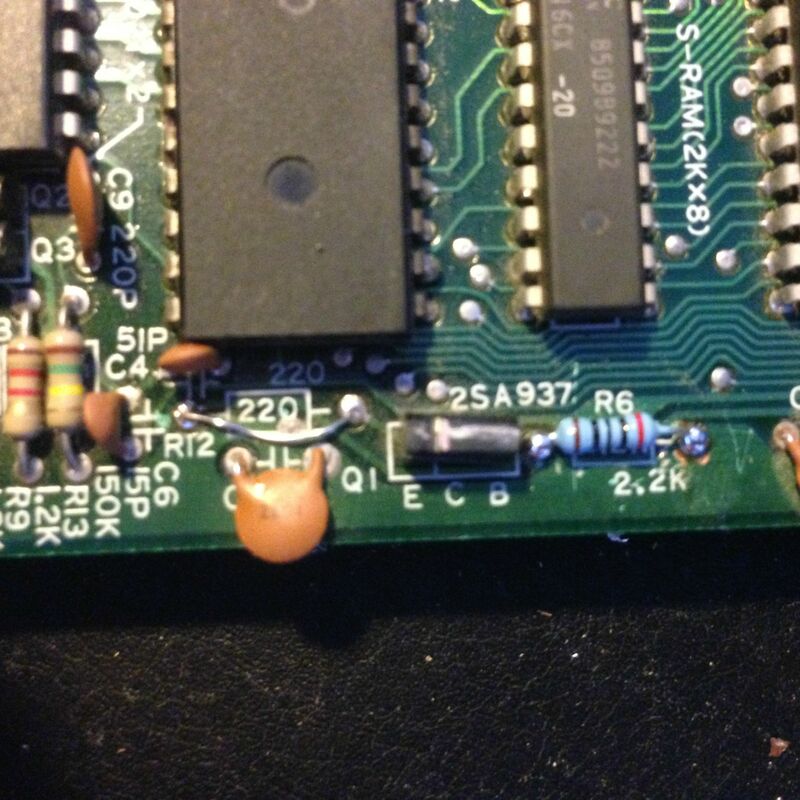 also a point with 60 to 72 pin converters, the NES cart goes in backwards im sure most would know that. Sorry, the tv I have doesn't support ch. 93, 94. I agree with the 1983-ish models. The board is clearly labeled unlike the 1988 one I have. The jailbars aren't as big as a problem, as it is an acceptable side effect. I mean, the NES composite output isn't so hot either. The AV modded Famicom is more colorful. Fixed my problem, everything is working as it should. I could improve it by lifting pin 21, but the jailbars are barely noticeable on the LCD and Trinitron. PPU pin 22 -> PPU pin 20, via 47uF cap - voltage (like 2v I think?) on each side of cap, circuit tester validated circuit from the actual pins to one another. 220uF cap on RF board - voltage around 3v on both sides. Resistors came through as good circuits according to the tester. Jump wire isn't shorted to the orange ceramic cap. But with all this seeming like what I'd expect, I have no signal at all. I get no measure when checking for the expected 75 Ohms on the video (formerly RF) output jack, and none of my TV's detect anything. The system is working for sure, I can hear game audio (coming from cartridge pin 46 -> an RCA jack) when powered on. Anybody have any ideas as to where I should look next? I really don't understand this circuit that the guide had me make, with all the random desoldering on the RF board. Can provide pictures if it'd be helpful, just tell me what you want to see! 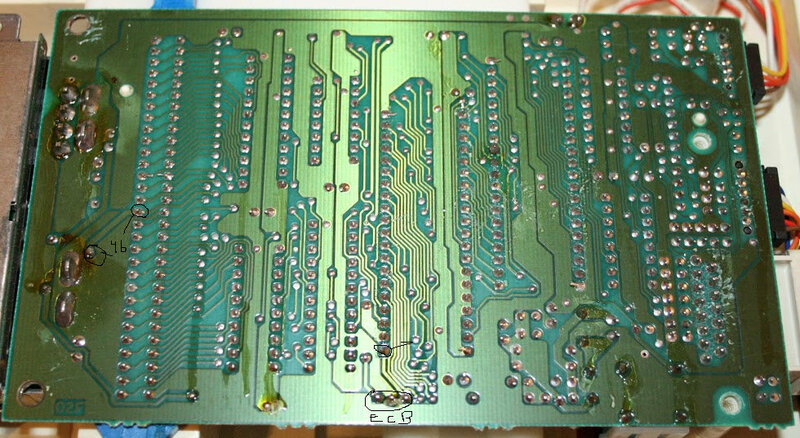 Post #11 in this thread has a schematic of the Composite Video circuit the AV Famicom uses. It's much nicer and requires less parts. Not sure what transistor it uses though. StoneAgeGamer sells Game-Tech.US's NES Top Loader AV mod board if you want a small premade one. It works in a Famicom. The NESRGB would be better but it requires desoldering the PPU, installing a socket where it used to go, then sitting the board between the PPU and the socket. This also means the eject lever can't be used anymore. 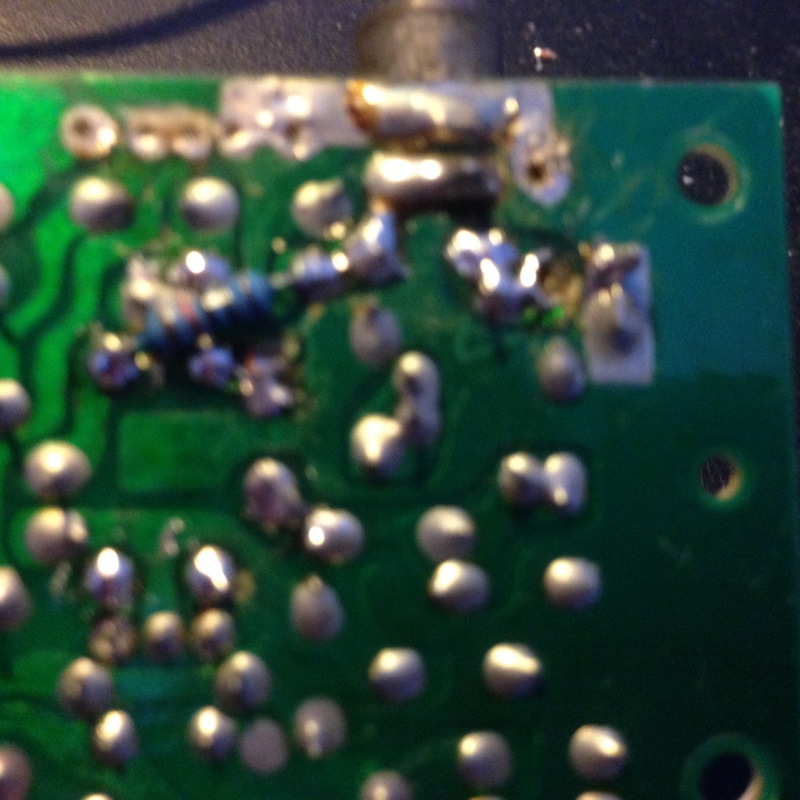 Turns out I'm just an idiot, and soldered the positive lead of the 220uF capacitor onto the wrong pad. Once I noticed that, I had video immediately. The method in this thread's OP definitely gave me some minor jailbars (HVC-CPU-07 board) on my Sony PVM, but nothing that really takes away from the game (or looks worse than composite video in general). Glad to hear it's working fine! I heard that wrapping the PPU in a thin layer of copper gets rid of the jailbars but I'm not too sure. Of course you would have to remove the PPU to do this. I would use this since this is what the av famicom uses. I would like to use this schematic to hold me over until I get a NESRGB or a NESHD but I'm confused as to which transistor to use. Would a 2N3906 PNP transistor work? Also, where does the C point connect to? Is it ground? just about any basic PNP transistor will do, 2n3906 is quite common in USA. Ah ok, thank you for the confirmation. So does C point connect to ground or what does that symbol mean? I'm still new to schematics. C is collector and that goes to ground. B is base and that is the signal input. E is emitter and that goes to the rest of the circuit. Typically a package of transistors bought locally has pinout info on package. If you bought online or got them without package, Google search will tell you which pins is which. Ok thank you. The transistors I have came from my Make: Raspberry Pi Starter Kit.